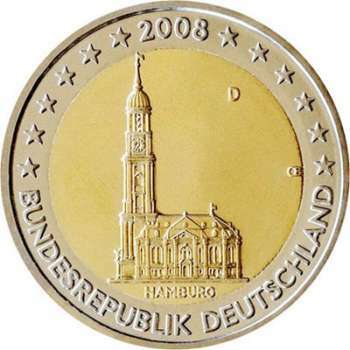 The inner part of the coin shows St. Michaelis Church in Hamburg. The name of the federal State HAMBURG is inscribed beneath the image of the church. To the right of the church are the engraver's stylised initials OE and above it towards the centre the mint mark ('A', 'D', 'F', 'G' or 'J'). The outer ring has the year mark inscribed at the top, six stars on each side and below them the words BUNDESREPUBLIK DEUTSCHLAND. Issued on 1 February 2008. Germany started the commemorative coin series Die 16 Bundesländer der Bundesrepublik Deutschland (The 16 States of the Federal Republic of Germany) in 2006, which will continue until 2021. The year in which the coin for a specific state is issued coincides with that state's Presidency of the Bundesrat. This is from the type of commemorative coins that was issued by a single country. 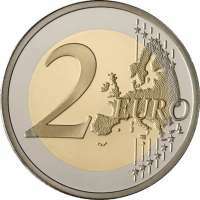 As a rule, euro countries may each issue only one €2 commemorative coin per year. Exceptionally, they are allowed to issue another, provided that it is a joint issuance and commemorates events of European-wide importance. It is Germany's national motto and the beginning of Germany's national anthem, followed by the Federal Eagle.